Danny DeVito and Michael Keaton make for the most fun Tim Burton movie in a long time, even if this anti-corporate fable is hard to swallow. An anti-corporate fable produced by a massive conglomerate that’s monopolizing the film industry while pawning chintzy reproductions of the precious jewels from its own vault, “Dumbo” isn’t exactly Disney’s finest hour. And yet, it’s almost certain to be the most creatively inspired of the “live-action remakes” the studio is releasing this year. For one thing, Ehren Kruger’s otherwise unremarkable script begins where the 1941 original ends, and dares — in its own tepid way — to add a human element to a story that never really had one. For another, you can only go so wrong with a cast that includes Danny DeVito as a two-bit P.T. Barnum, and a larger than life Michael Keaton as the best villain that a “Bioshock” game never had (brace yourselves for a “Batman Returns” rematch 27 years in the making). But to the limited extent that “Dumbo” works, it ultimately does so because director Tim Burton finds a way to make it his own without choking the life out of the source material. After a long spiral into self-parody — characterized by a penchant for turning classic stories into hideous Times Square caricatures of themselves — Burton has crafted a piece of open-hearted pap that isn’t too affected to breathe. Yes, this is still the same guy who transformed “Alice in Wonderland” into an unholy alliance between Margaret Keane, Jeff Koons, and “The Lawnmower Man,” but he seems to have rediscovered a method to his signature madness. 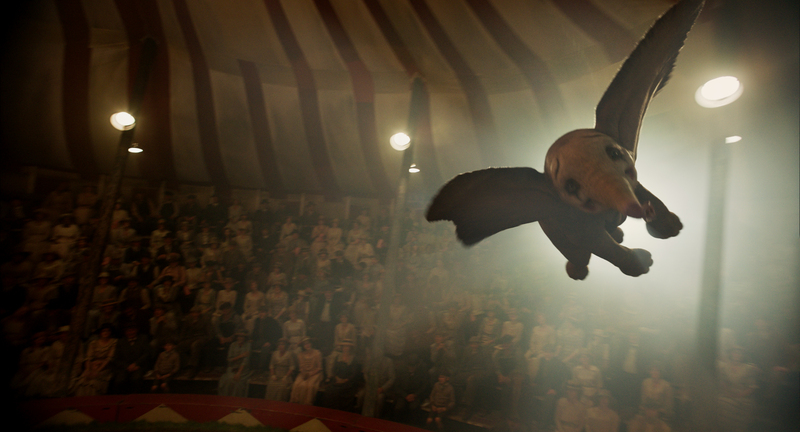 At the risk of damning the film with the faintest of praise, “Dumbo” floats just high enough to clear the incredibly low bar that it sets for itself. DeVito, though — DeVito soars. Completing the trilogy of ring masters he started as The Penguin and continued in “Big Fish,” the actor is sublime as Max Medici, the manic leader of the Medici Brothers Circus (the name is just a clever bit of flim-flammery that makes his two-bit operation sound like a family legacy). Like a streak of grease smeared across an Edward Hopper painting, he barrels into the movie with the fevered conviction of someone who knows his purpose but has lost his path, and Burton — who might understand what that’s like — lets DeVito run wild. Max is the most elevated part of a feather-light fantasy that usually keeps at least one foot on the ground; a slapstick gag involving a monkey in a desk drawer is a fun reminder of Burton’s superhuman comic timing. Max is four feet and 10 inches of good old American hogwash, and the kind of natural-born showman who would sooner delight someone out of $1 than scam them out of $100, but that’s not the reason why his motley crew of lovable curiosities have fallen on such hard times. It’s 1919, and the Great War has taken its toll. A big chunk of Medici’s audience has died overseas, and his star performer — a handsome cowboy named Holt Farrier (Colin Farrell) — has just come back from the trenches with one arm and no hope. Holt’s wife died when he was serving his country, and he has no idea how to be strong for the two motherless kids (Finley Hobbins and Nico Parker) who barely recognize him; in short, he’s a man without an act. And the likes of Miss Atlantis (a mermaid played by Sharon Rooney) and Rongo the Strongo (DeObia Oparei, in a wonderful deadpan performance as Max’s overextended right-hand man) aren’t enough to compensate for that loss. Lucky for Medici and his non-existent brother, their prize elephant is pregnant, which gives them something to sell — to a buyer, if not a crowd. Alas, Mrs. Jumbo gives birth to an adorably deformed calf, and nobody wants an animal with floppy wings sticking out of its face. Even in the circus, which exists to restore a measure of wonder to the world, some things just don’t fly. And some things do. From the very start, Burton seems more engaged than he’s been in a long time. You can spot his attention to detail on the side of Medici’s train, which introduces the circus acts with painted illustrations on the outside of each car; you can detect a romantic warmth in the watercolor sunsets of the soundstage backdrops, which err closer to “Days of Heaven” than they do to “Dark Shadows.” Later, when Keaton saunters into the story as the deep-pocketed V.A. Vandevere (a performance big enough to be its own circus attraction) and lures Medici’s troupe to his Art Deco nightmare of an amusement park, you can feel a corrupted sense of wonder in its curved archways and blinding lights. Long after “Dumbo” loses your interest and half of the cast seems to be asleep on screen (shoutout to Alan Arkin, whose hilariously lazy performance as a powerful banker gives viewers permission to stop caring about the plot), Keaton and DeVito are still having the time of their lives. It’s a good thing that some of their joy is contagious, because Krueger’s script can only pretend to concern itself with Holt’s arc for so long, and the action-packed finale isn’t exciting enough to dispel the nausea of watching a multi-billion dollar empire force-feed the entire world another ultra-basic tale about how the fortune of a lonely man is less valuable than the pittance of a family. That’s a lot to swallow these days, especially when it’s coming from Disney. At least Dumbo works. Of course Dumbo works. He’s a hyper-expressive wonder who’s easy to love and tempting to believe (even if computer-generated animals still move a bit too deliberately to fool the human eye), and his director knows how to use him. Burton has long been American cinema’s most unambiguous defender of social outcasts and ugly ducklings (a mantle he’s carried from “Pee-Wee’s Big Adventure” to “Miss Peregrine’s Home for Peculiar Children” with such consistency that he’ll probably be buried with it in when he dies), so a pariah-like pachyderm is par for the course. The elephant might be a classic Disney icon, but he’s also just another character whose flaws make him special; at the end of the day, the most significant difference between Dumbo and the average Burton lead is that he’s got bigger ears and smaller eyes. Even if this movie drops the ball on the emotional relationship between Dumbo and his mom, it still manages to convey the pain of being cast aside and the joy of finding a place in the world. But maybe Burton sees more of himself in Max Medici, an outsider artist who sells his soul to the devil only to learn how little that buys him. As hard as it is to stomach any kind of anti-capitalism messaging from the studio that ate Hollywood, it’s even harder to shake the feeling that Burton is finally trying to renege on that deal, or at least retreat into the long-forgotten recesses of his comfort zone. His “Dumbo” never reaches the drunken highs of the original (despite running almost twice as long), but it’s most exciting moments tap into a kind of deliriousness that only he can deliver. Like many (or all) of the movies Burton has made this century, “Dumbo” is a shallow pop spectacle that’s forced to rely on its more superficial charms; unlike many (or all) of those other movies, this one actually has superficial charms on which to rely. In its best moments, such flourishes and grace notes even manage to complement each other and suggest the presence of something that vaguely resembles a soul. Like, say, a flying elephant, it’s the kind of thing you have to see to believe. It’s just not quite the kind of thing you have to see in the first place. Disney will release “Dumbo” in theaters on Friday, March 29.